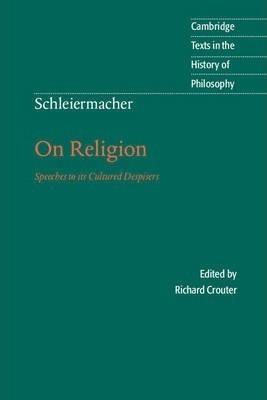 A classic of modern religious thought, Schleiermacher's On Religion: Speeches to its Cultured Despisers is here presented in Richard Crouter's acclaimed English translation of the 1799 edition, originally published in Cambridge Texts in German Philosophy. Written when its youthful author was deeply involved in German Romanticism and the critique of Kant's moral and religious philosophy, it is a masterly expression of Protestant Christian apologetics of the modern period, which powerfully displays the tensions between the Romantic and Enlightenment accounts of religion. Unlike the revised versions of 1806 and 1821, which modify the language of feeling and intuition and translate the argument into more traditional academic and Christian categories, the 1799 text more fully reveals its original audience's literary and social world. Richard Crouter's introduction places the work in the milieu of early German Romanticism, Kant criticism, the revival of Spinoza and Plato studies, and theories of literary criticism and of the physical sciences, and his fully annotated edition also includes a chronology and notes on further reading. First speech: Apology; Second speech: On the essence of religion; Third speech: On self-formation for religion; Fourth speech: On the social element in religion; or, on church and priesthood; Fifth speech: On the religions.